It is no exaggeration to say that the redevelopment of Yesler Terrace will be one of the most significant development projects in Seattle in many decades. Yesler Terrace was built in 1939 on a 30-acre south-facing slope roughly bounded by Harborview Medical Center, I-5, Little Saigon, and Boren Ave. Seattle’s oldest low-income housing project, Yesler Terrace currently houses 1500 residents in 561 units. The Seattle Housing Authority (SHA) plans to follow the general model of redevelopment that was applied at Rainier Vista, New Holley, and High Point. All the existing low-income housing will be replaced, and for-sale housing will be added to create a higher density, mixed-income neighborhood. From October 2006 to October 2007 a citizen review committee created a set of guiding principles for the redevelopment, as well as a set of planning concepts. Because of its central city location, Yesler Terrace is more suitable for higher density commercial development than were the three projects mentioned above. The planning concepts recognize the potential to “leverage density” with “dense mixed-use development” on the site’s borders, as well as “taller buildings” adjacent to Harborview. In April of this year SHA selected local architecture firm Collins Woerman to lead the master planning process for redevelopment. 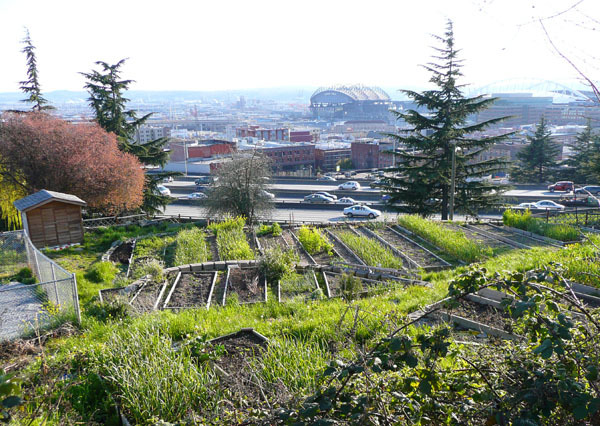 Yesler Terrace is literally on downtown’s doorstep. The site offers spectacular views, from Mt. Rainier in the southeast all the way around to the Olympics in the west. It has copious southwestern solar exposure. Redevelopment offers unprecedented opportunities to apply the newest and best sustainable design practices to the site, the buildings, and the infrastructure. And it presents the chance to reconnect and revitalize a neighborhood that has long deserved better. 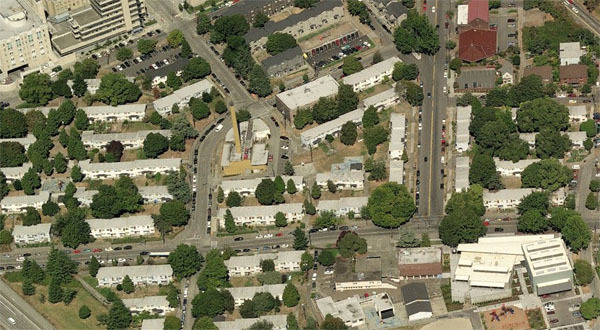 In short, Yesler Terrace is a “hundred-year” opportunity for Seattle. For once, might we see all the Seattle players step up, be bold and visionary, work together (but not be afraid to piss a few people off), and make this thing happen to its full potential? Posted by dan bertolet on	Monday, May 19th, 2008 at 9:10 pm. You can follow any responses to this entry through the RSS 2.0 feed. You can leave a response, or trackback from your own site. This is eerily similar to the Little Mountain redevelopment in Vancouver, BC…. Will be very interesting to watch them both. Anyone know what citizens were on the review committee that created the guiding principles? YAh i guss it’s all about the money right right but look what your rilly doing kicking alot of poor people out on the cold stree’s . my unkle has lived in the yesler terrace for 14 year’s he’s 68 year’s old where is he going too go think about that. Good opinion. I step by later to review some of your other posts. great issues altogether, you simply won emblem reader. What could you suggest in regards to your submit that you made some days ago? Any positive? Wonderful web site. Plenty of helpful info here. I am sending it to a few buddies ans additionally sharing in delicious. And of course, thanks for your sweat!